Vision is a physical sense that uses light to provide your brain with invaluable details of your target. The night vision goggles magnify the ambient light to minimize the issues associated with unassisted vision in complete darkness. It is important to highlight the additional abilities provided by night vision goggles. You can increase your chances of success hunting at night with the help of best night vision goggles. Apart from having a clear view of your target; you also get to protect yourself from the surrounding by knowing where you step. As far as night vision technology is concerned, you are presented with two choices: light amplification or thermal imaging. Goggles that use light amplification operate by enhancing the low light of the moon and stars. Light amplification ensures that the low end part of the spectrum receives enough light, allowing you to have a better view of your target. On the other hand, goggles that use thermal imaging work by picking up heat signatures of your target. A better choice between the two is thermal imaging goggles. This is a very important consideration that you must make when shopping for hunting goggles. You need a model that will guarantee a high quality image. This means that high resolution, less distortion, and more details of the target. You should know that minimal distortion produces a flatter image. Night vision goggles deliver monochromatic green pictures. Green is preferred because your eyes are able to distinguish images better than in other colors. The most ideal night vision goggles are those that remain sharp at the edges as well as at the center. 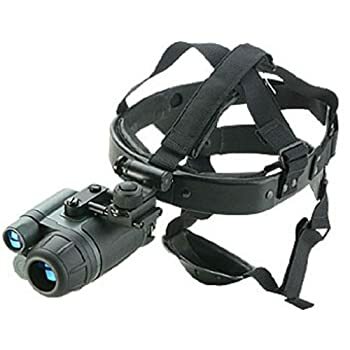 Therefore, to obtain improved image quality, you need night vision goggles that have the ability to produce high resolution and high definition images. You need goggles that can produce an enhanced image of your target regardless of how dark it becomes. Normally, your night vision ability deteriorates as your viewing distance increases and ambient light diminishes. Therefore, you need goggles that enhance gain in low ambient light without necessarily interfering with image focus. You should know that there are some goggles that use infrared light and longer lenses. These types of goggles are effective, but they do usually end up compromising clarity. So, make a wise pick. You need goggles with an appropriate range. You need a magnification power of 1X and higher to be able to pick a target at a considerable distance. You would probably think a powerful and long lens can do the trick. Technically, a powerful and long lens will provide you with the desired range. Regrettably, long lenses have a tendency of performing poorly in complete darkness. In light of that, you should consider goggles that feature high speed lens that has moderate magnification power. Goggles with high speed lens have the ability to pick more light, and they offer desirable ranges along with higher gains. The ability of night vision goggles to deliver a clear image in low light and complete darkness is great. However, you need to go for a rugged design that will not only offer the best image quality, but can also withstand hostile environmental conditions. You have to make sure that the design material that is crack-proof, weatherproof, and heat-proof. Ergonomics goes hand in hand with durability. Apart from being weatherproof, your goggles must be easy to mount. They have to be lightweight as well as comfortable. This way you will not feel any added weight when you wear them on your head. So, make sure the headgear does not affect your skin in any way. Product Specifications: Generation 1; one CR123A 3-volt lithium battery; 36 lp/mm resolution; 24 mm diameter objective lens; 400m maximum viewing range; 1575’ field of view at 1000 yards; infrared illuminator; 30-degree angle of view; & 1.0X magnification. Description: The Firefield Tracker is the best night vision goggles for the money. They offer amazingly clear details of the target in complete darkness. Apart from being lightweight, the body is rubberized and rugged for durability in hostile environments. The operation of the goggles is based on the built-in IR infrared illuminator, which works by emitting a throbbing frequency that is highly efficient, thus less battery drainage. The design is incorporated with a solid eyeshade that ensures your eyes are safeguarded from excessive flashing. The 24mm lens system, 523m FOV, 30-degree angle of view, 1.0X magnification, infrared illuminator, 400m maximum viewing range, and 36 lp/mm resolution offer you maximum performance. Highly durable and good quality. Apart from being water-resistant, it comes with a comfortable head harness mount that you can wear contentedly for more than twenty minutes when hiking or trekking. Firefield Tracker harness head mount may give you a hard time before you get used to it. Product Specifications: IIT Gen 1+ tech; storage temperature (-45 to +50°C); 30-40 lp/mm resolution; environmental rating weatherproof; 1X magnification; convenient battery life (58 hours IR off & 12 hours IR on); 20.6mm objective lens diameter; low battery indicator; 8mm exit pupil diameter; IR indicator; 20mm eye relief; built-in flood lens; 35mm lens system; controls digital; 40° FOV; +4 to -4 dpt. diopter adjustment; and 0.2 to infinity range of focus. 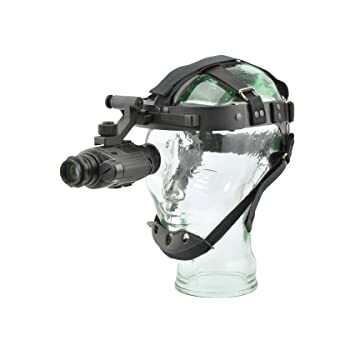 Description: The Armasight Vega is one of the best night vision goggles Gen 1+. It may appear cheap, but it certainly works wonders. This should be your first choice if you are after a simple, affordable, and highly ergonomic. It is one of the lightest NVGs you can find in the market. Weighing in at 0.5 pounds, it mounts comfortably on your head without causing you any discomforts. Its operation is based on Gen 1+ high resolution image intensifier tube. The design’s toughness is improved by the reinforced composite housing. Highly versatile, you can use it with either your left or right eye. The reinforced composite housing is extremely lightweight and exceptionally compact. It’s equipped with adjustable headgear for more comfort and hands free operations. Has less fish eye effect about the peripheral, and it needs CR123 battery for its operation. Product Specifications: Gen 1 image intensifier tubing; -22 to +104°F operating temperature; 1x magnification; up to 30 hours estimated battery life; 24mm lens diameter; 3V (CR 123A) battery power supply; 30° FOV; 32 to 36 lp/mm resolution; up to 100 yards effective IR illuminator distance; 1 to infinity focus range; up to 160 yards detection distance; +/- 4 diopter adjustment; & 12mm eye relief. Description: Yukon NVMT is the best night vision device for hunting at a distance of approximately 160 yards. 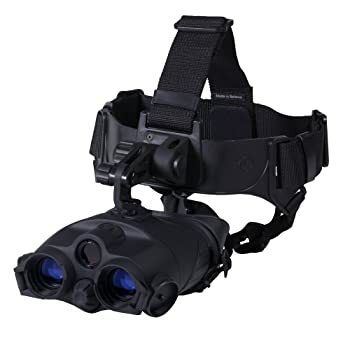 Unlike other night vision goggles you will find on the market, this particular model is engineered to offer hands-free night vision operation along with the maximum value of a 1×24 night vision device. It has a magnification power of 1.0x, which produces an undistorted and highly visible image. Its hands-free operation is made possible by the easy to secure headgear. The design is lightweight, compact, and rugged. Therefore, it stays in position ensuring that the image stays put until you hit your target. You get the best performance. You can actually navigate through darkness and still pick your target as you would have intended to. Has a poor depth perception even though you can pick finer details after focusing the lenses. Product Specifications: Gen 1 tech; IPX3 weatherproof rating; -4 to 104°F operating temp; ¼ in tripod mount; glass filled nylon composite design material; glass lens; 805 nm IR wavelength; 2x AA battery type; 72 hours battery life minus IR & 20 hours plus IR; +/-5; 12mm eye relief; 162.4 ft. @ 100 yard FOV; 1.0x magnification; & 30 lines per mm resolution. Description: First of all you should know that the Sightmark Ghost Hunter is the best night vision goggles for hunting under Gen 1. So, you should not be quick to judge its abilities in the field. To begin with it delivers high resolution and image quality that produces a clear image of your target in total darkness. 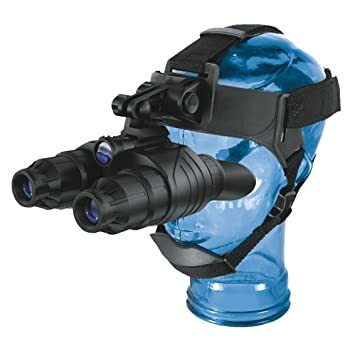 It is one of a kind night vision device. It features unique specifications that retain depth perception of your target, and allow you to navigate your surroundings with ease. Offers high quality resolution, high power IR illumination, and close range focus. Ergonomic and durable design that is lightweight, weatherproof, and hands-free head mounts. Its performance surpasses the expectations of Gen 1 night vision devices. Needs constant adjustment of the focus, and has limited lifetime warranty. Product Specifications: CF-Super Gen 1+; IP44 weatherproof; 20mm objective lens; -20 to +40°C; 50 hours minus IR & 20 hours plus IRR operating temp; 42/36 lines/mm resolution; 2x AAA batteries; 40° angle of view; 4mm exit pupil; 450 feet detection range; & +/- 4 diopter eyepiece adjustment. Description: Pulsar Edge GS Super is the best night vision goggles for outdoor maneuverability. This pair offers you the ideal end-to-end resolution for precision target acquisition that ensures you obtained undistorted image of your target. The wide-angled built-in IR illuminator feature gradual power adjustment functionality. Its in-built auto bright source protection, high resolution, multicoated lenses, and R-contact optical system ensures you get a clear image irrespective of the low light levels. The goggles offer continuous image quality of your target across the whole FOV. This is made possible by the CF-Super resolution. The CF-Super offers high resolution as well as geometric image precision that ensure effective field of view. Your eyes are always protected when using the device. It is installed with tube protection that automatically ceases or reduces luminance once the threshold level is surpassed. The headgear mount is tighter, and it takes time to cool down after shutdown. They were previously engineered for navigation during military missions, but they have gained popularity among hunters. The technology used by night vision goggles allows you to see visibly in low light as well as in complete darkness. 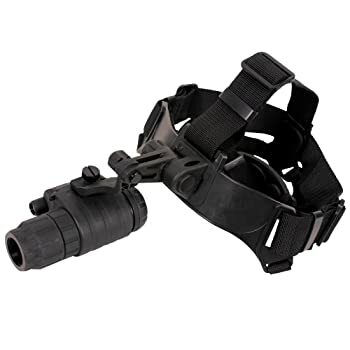 All night vision goggles you can find in the market are resourceful and highly versatile, but you still have to choose the best with the help of this guide. Night vision goggles might be a better alternative to night vision binoculars since you don’t have to hold anything the entire time. Thanks for this good article. I have learned a couple of important tips which will be helpful on my night vision goggles shopping. Also, the products that you’ve suggested looks good.